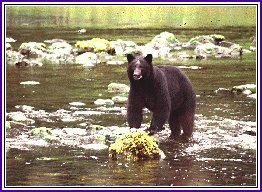 Black bear are abundant and widely distributed throughout Southeast Alaska. Black bears feed on salmon to build fat reserves before hibernating for the winter. They also eat dear, berries and roots. 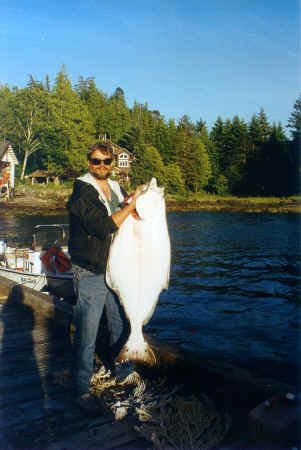 Each day take your choice of fishing or scenic tours aboard the Double Jeopardy. Be sure to bring your camera for wildlife pictures. Bald eagles are everywhere. Enjoy watching humpback and killer whales, seals and porpoise from the boat or hike up a stream to cast for trout and watch bears catching salmon. See mountain goats perched on rocky bluffs in Misty Fjords. These photo icons allow you to view Mike Holman's wildlife photographs in a large format. Click on these photographs to take a look at some of the great views and at the unique environment that is Southeast Alaska. Feel free to copy these pictures, but please do not alter them in any way.